A picture says a thousand words and that picture has tears welling up in my eyes. Look at our legends resplendent in their uniform, nay attire. Notice the grit and determination in the faces of champions. Look at the crowd, my what a crowd. Bob you had asked for how long will I sing my song on accountability and transparency. In that picture lies the answer ma brother. I will sing until Gor Mahia scales those heights again. 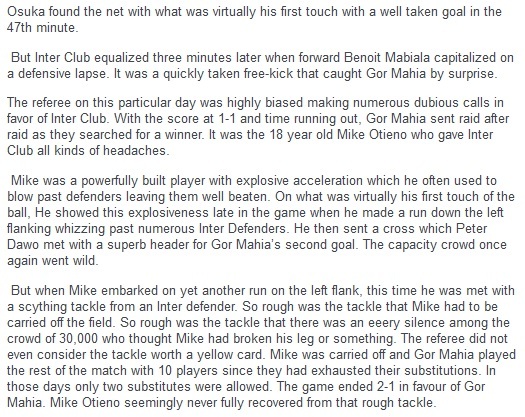 To the hooligans take note Mike Otieno was ruthlessly tacked but there was no uncouth or unpalatable behaviour not that fans of that time were not as passionate. And I don’t remember this nonsense of free entry. 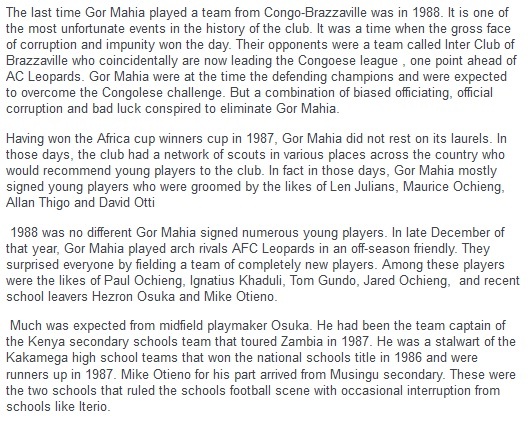 GOR MAHIA WAS ON TOP THE PLAYERS, THE FANS, THE EC. THAT IS WHAT WE MUST EMULATE. I agree with Bob and Baba Travis, let us try to start implementing the good ideas of this blog ourselves. 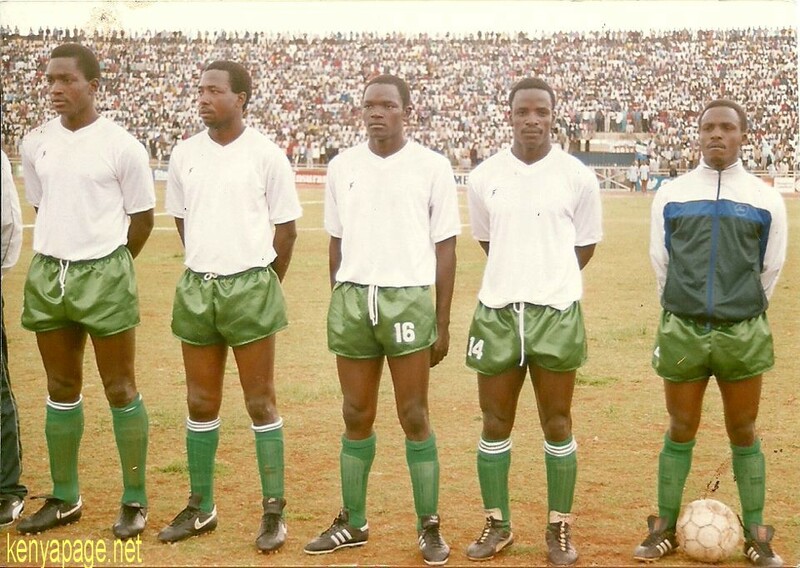 Long live K’galo, Viva Gor Mahia Aluta continua. Those numbers are still haunting me…..looking at the crowd in Russia and considering that Nyayo has no seats, it’s discernible that Kogalo used to attract more than 60,000 fans per home match at Nyayo. You can see the numbers in Moi Stadium Kisumu, and this is all down to hooligans. Kisumu matches havent been bedevelled with hooligans per se….may be we should hold more matches there to attract more gate collections. In the meantime, hooliganism in Nairobi starts at the gate, where the ‘boys’ let in all. How I wish we could stop using ‘boys’ at the gate!!! Why not use established security channels? We are our own enemies. But all is not lost. There’s a lot cooking and Kogalo will be a force to reckon with again in 3-5 years. Nostalgia, simply NOSTALGIC !!!! in 1988 Kogallo could fill 30,000 stadium, I remember the game, I probably was in the crowd. 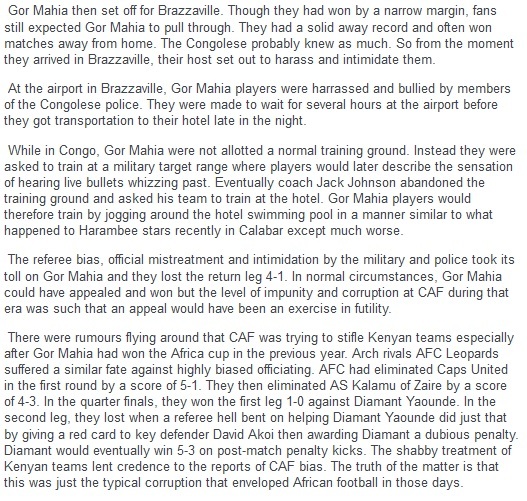 people used to travel from as far as Dar es salaam by train to come and watch gor mahia, I remember meeting people even from butere ……so what went wrong thereafter ? simple leadership. 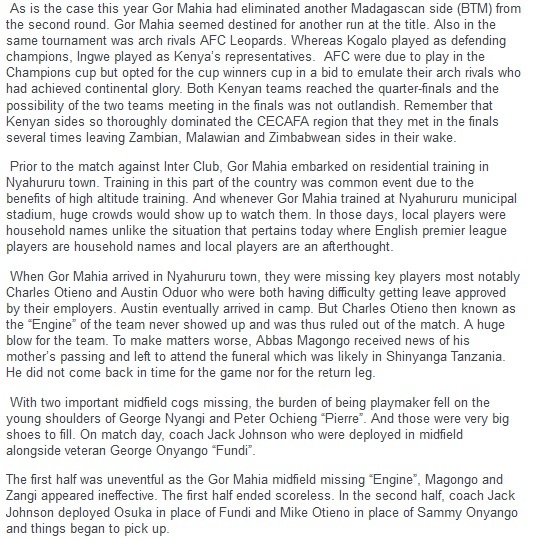 that is why this gor mahia SACCO should not just be for Kenyan fans, it should be accessed by fans from all over the world. I was there but this picture is taken at Nyayo Stadium, all the same the picture says a lot about then and now. There was grit and determination,the crowd was just good, the atmosphere just superb, nobody would rouse any rabble any howly unlike now when yobs are an eyesore. When shall we regain such lost glory. That said,go boys go. This is your home and its your game,nobody should come here and brag that they are superior, superior for what, about what, football? Nooooo, it is a round piece of leather only and can roll in any direction and into any goal. Only eleven of them will be in the field at any time, against eleven. They should know people on this side of the world. FKF, FKF, FKF where art thou? Hear us ooh mighty FKF, let the youth have their game and earn something for a living and support their families, please ooooh FKF hear us. Those were the DAYS when GM come down the lake, dad had to give me a good clobbering with several strokes of the cane of which I was ready for anyway. Those were the DAYS I new GM line-up like the back of my hand better than the national anthem. That ICONIC PICTURE……. I have nothing more to say. Those who could not make it into the stadiums would remain glued to their radios.The positive lessons that can be learnt from the those days are indeed nostalgic. May this could be used as a platform to talk about discipline and the need to be responsible. It is a good name that attracts and not a bad name.I indeed see what happens at the gate and my heart breaks. When some people come with an attitude to force their way in and then they consider that to being a macho man is in-fact archaic. Timbe mag apuodho kabisa. Let all these legends who are still alive today be invited to every match just to give a pep They can also use other forums like TV and Radio inter-views. Especially after news. K’Ogalo is a Nation let us take advantage and build K’Ogalo. May be these guys behave this way because of the environment which may not have given opportunity for such. We must not cry like all is lost, it can be done, it is possible. Some body just needs to stand up and lead the way forward. very nice articles…can the admin change the font for the comments…they are nice to read but the font makes it very difficult..